There is just something so dependable and high quality about a good metal shed. Here at WhatShed we have put many metal sheds through their paces, but today we are kicking things up a notch by looking at the people who actually sell these metal sheds. 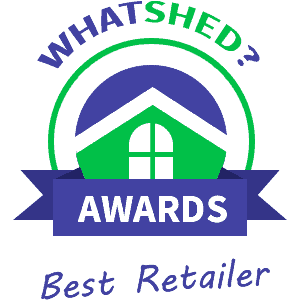 That is right, we are doing a top 10 metal sheds retailers list with all the glitz and the glamour of an episode of Top Of The Pops from the 80’s. One thing we must say is that actually nearly all of these sites are fantastic and do what they do very well, so this was a hard list to put together. But we did give each one a fair look so you can rest assure that these are our honest opinions on who is the best metal shed retailer. clearly. Most of the sheds offer some kind of customisation or extras which is a nice touch. The fact that they make it so easy to contact them if you have any questions is something else that makes us give them two big thumbs up, followed by a high five. not try to overload you with extras and customisation options, but at the same time these options are not as easily seen as they are on the Shed Store site, which is why they just beat Waltons to number 1. Still this is a fantastic site that offers some very cool looking sheds and they also have great customer service. a quick answer online without having to actually speak to a person on the phone because let’s face it who actually wants to do that? They are not really offering many extras or other options with many of their sheds, but to be fair this can be seen as a good or bad thing depending on your point of view. We see Buy Sheds Direct as a solid site and one that you will find easy to have a look around. to know, such as if they come with a floor or not which some sites are not as always as clear with. They do offer very quick and responsive customer service as well as rather speedy delivery times so this is certainly a site that you will want to check out, we just wish that they had a few more extras and customisation options for their sheds. sections, so while the site has a vast collection of products, you are going to have to do some clicking around to ensure you do not miss something really cool. This may be a little bit more work than some people want to do and we totally get that, but if you are willing to click around here then you are going to be blown away at the selection that they have. has more than a few pictures and a detailed description as well. So again this is not going to blow you away with their selection, but if you want a quick, fair priced and easy way to get a metal shed then this is the way to do it. If they had a slightly larger selection then they would have certainly been a little higher up the list. of a pain in the rear end. It is just a little bit too busy for our liking. As is always the case with Garden Buildings Direct, the customer service is fantastic and their selection of sheds is not too shabby either. We just wish this part of their site was presented in the exact same way as their wooden sheds section is.
. While it may be far down on our list, there is not actually a whole lot wrong with what Wickes are doing so if you do want to purchase your metal shed from a more mainstream retailer then we are sure you will have no problems with their site. it is easy to look around and will not cause you any problems. They do offer some DIY advice, which will probably come in handy for those of you who are not too skilled at DIY. they from somewhere else. So while the site may have a lot of information about each metal shed and also show them off with plenty of pictures, we feel that their long delivery times and their less than fantastic customer service make them a site that you should think long and hard about before you actually use.